When people first start putting together a capacity planning model for their clinical services, they usually model follow-up outpatients (known as “repeats” or “returns” in Scotland) as non-waiting list services. It’s easier, and it effectively assumes that the number of outstanding follow-ups will remain roughly constant – which is a fair starting assumption. However in many hospitals there are concerns that some follow-up outpatients are waiting too long between appointments. Sometimes these follow-up patients (who are not covered by waiting times targets) are even being cancelled to release capacity for new outpatients (who are). I take a very simple approach to this: follow-up outpatients are clinical priorities, because they are time limited. So new routine outpatients should never take precedence over them, no matter how long they have waited. And if anyone disagrees that a particular follow-up outpatient is a clinical priority, then they are invited to consider whether that patient needs to be followed up at all. Now that we’ve got the principles straight, how can we use Gooroo Planner to plan the right amount of capacity for follow-up outpatients, taking into account any backlogs that need to be cleared and the knock-on effects of doing that? 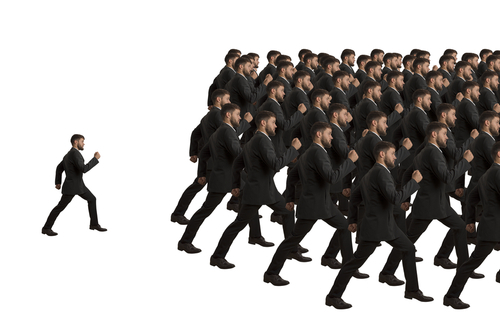 removals other than activity: the number of patients who were going to be followed-up but now aren’t – this might happen at short notice as a results of patients failing to attend appointments. and this provides a way of cross-checking the data quality. We also need to know how quickly these patients need to be followed-up – the quicker they need to be seen, the fewer appointments we can have outstanding. For instance if we see exactly 10 follow-up outpatients per week, and each patient waits exactly 10 weeks between appointments, then at any given moment we can have 100 patients who are waiting for their next appointment (according to Little’s Law). But if they only wait 5 weeks between appointments, then at any given moment we can only have 50 patients waiting for their next appointment. To make matters more complicated, we may have a mix of patients who need to be seen at different intervals. For instance, in ophthalmology, wet AMD patients need to be followed-up every month for their Lucentis injections and visual acuity tests, whereas patients waiting for glaucoma may be followed-up at longer intervals. So we need to know how many patients need following-up how often, before our model can calculate the maximum size of waiting list that we can sustain. The hospital patient administration system (PAS) may contain specific information about the clinically appropriate time interval to each patient’s next follow-up appointment, for instance by stating their intended appointment date. Otherwise it may be possible to estimate the best time interval from the patient’s diagnosis, their intended outpatient procedure, or the clinic they should attend. If all else fails, it may be possible to use the actual time between appointments as a basis, even if appointment intervals are being stretched; for instance we could assume that any patient seen with a 4-8 week interval should ideally have waited 4-5 weeks. This file can be uploaded into Gooroo Planner with two urgency levels set, one up to 3 weeks (which will be populated with no patients from this small sample), one from then up to 5 weeks (which will contain the first two patients – i.e. 50% of the activity), and the balance (the other two patients) being subject to an overall maximum waiting time target set at 26 weeks. If different specialties see their follow-ups at very different time intervals, then we may want to define different urgency levels for each one. This is easily done: just upload a separate file for each different system of urgency levels, and this can be done both via the on-screen interface and for automated modelling via the Gooroo API. Once we have worked out the activity needed to keep up with demand, and the backlog clearance required, we will want to convert that into clinic capacity of slots and hours per week. To work out the number of slots per week we usually just need to know the proportion of weeks worked. So if we are working out consultant job plans then 42 weeks of the year (80 per cent) might be typical. Or if we are working out physical clinic space – and there is scope to substitute for absent colleagues – then 50 weeks (95 per cent) of the year might be assumed. Then to convert those slots into hours, we need to know the average time per patient and the expected clinic utilisation rate. We can also take account of any assumptions about cancellations, and any deliberate overbooking in anticipation of those. We can enter these expected performance figures directly into Gooroo Planner by uploading them as statistical data. Alternatively we could use patient-level activity data, as in the ophthalmology example above, and tag each patient with data about their appointment: the session ID, the length of that session, and the length of the patient’s appointment. That way, Gooroo Planner can calculate all the performance statistics for us. Should follow-up outpatients be modelled independently, or as a service that is downstream of new outpatients? 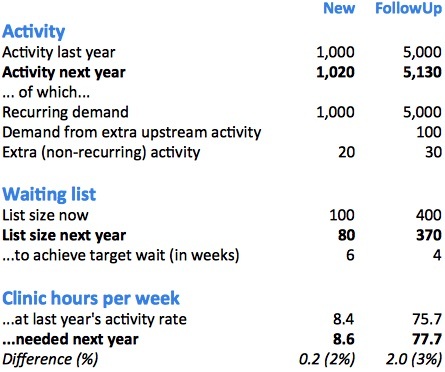 It really depends on how strong we think the link is between new activity and follow-up demand. Some follow-up outpatient services tend to have a life of their own, especially for chronic conditions like wet AMD where patients continue to be followed-up indefinitely. In a service like that, the demand for follow-up outpatients may be only weakly dependent on short-term changes in new outpatient activity, and it would make little sense to model follow-ups as “downstream” of new outpatients. But other follow-up services may have a more clearly defined course of treatment. For instance, patients may typically receive a course of ten appointments for orthodontic treatment or cognitive behavioural therapy. In this case, it might make sense to link follow-up demand to new outpatient activity, by placing the follow-ups downstream of the news. In the following example from Gooroo Planner, we have a new outpatient service which saw 1,000 patients last year and kept the waiting list constant (i.e. demand was also 1,000 patients). If half of those new outpatients needed a course of follow-up treatment, then last year 500 patients needed such treatment. If the course of treatment is an average of 10 appointments, then that means follow-up demand was 5,000 follow-ups, which is what we can see in the follow-up column below. Gooroo Planner has worked out that next year we need to see an extra 20 new outpatients, to get down to a 6 week wait. At the historic conversion rate, half of them (i.e. 10 patients) will need a course of 10 follow-up appointments each, which comes to an extra 100 follow-up appointments as shown in the follow-up column. We also need to reduce the follow-up backlog by 30 in order to achieve a 4 week interval between treatments, and this is shown in the follow-up columns as extra activity. Finally, if each follow-up treatment takes 40 minutes and we work 95% of the year, all of this recurring and non-recurring follow-up activity amounts to an extra 2 hours per week of extra clinic time, compared with last year’s activity rate. Modelling follow-up outpatients as waiting list services is essential if there are concerns that follow-up intervals are being stretched. In fact, this is one of the first modelling enhancements that people choose to make, which suggests that such concerns may be widespread. So if you’ve done the initial one-day implementation of Gooroo Planner, and got all your specialties loaded up hospital-wide, you may want to tackle follow-up waiting times next.